Another post, another baby project. Another girl 🙂 Welcome to Part four of the baby fever series! 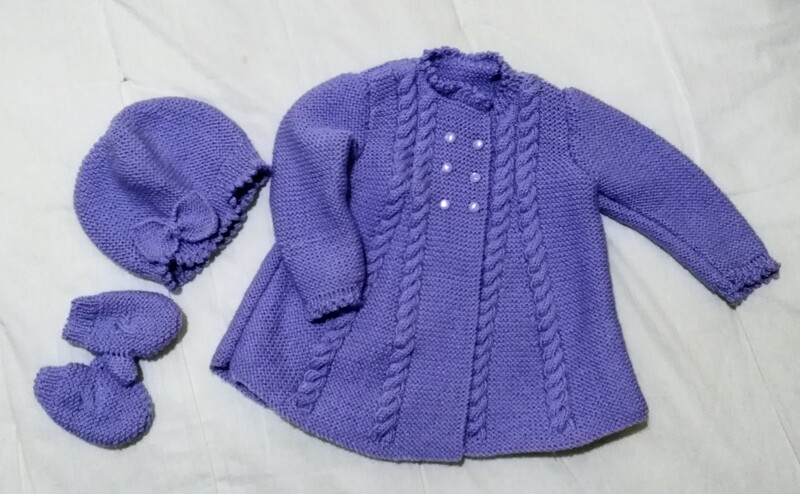 In this part, I made this adorable and delicate set for a little girl with a head full of dark curly hair 🙂 This little girl belongs to another wonderful friend of mine who has a taste for delicate things so I looked hard for a great pattern to fit her tastes. And after a good amount of hunting around, I found the perfect one! I found the pattern on the Love Knitting* website and I have to say that I immediately fell in love with it. I looked around to see if I could find something different but I kept going back to this one. It’s a set which includes one of the loveliest coats I’ve ever seen, a hat which can be worn two ways and a pair of mittens. You can find the pattern here*. I’m not going to lie. It’s not the best explained pattern out there and I did struggle a bit with the coat and the mittens but I finally managed to get it right. For the wool, I used Paintbox Yarns Simply DK in Pale Lilac (145). It’s quite lovely and truly a lovely colour. They have lots of other beautiful colours and you can find this particular wool here*. Of course, I started with the coat. I didn’t realise at first that it wasn’t knitted whole (front and back together) so I was quite a bit confused. But then I looked at the pattern again and felt a bit stupid. The back side was fairly easy to make. The problem came when I started knitting the front and started to finish up the armhole and the neck shaping. I ended up with two uneven sides. I read the pattern again once, twice, 5 times and I still couldn’t figure out where I went wrong. I asked for mum’s help and then we both realised that I had to do everything in reverse. Unfortunately, the pattern was not very clear in that aspect, but I managed! This is the finished result. It’s quite lovely as you can see and it was definitely worth all the work. I especially love the neck and sleeve edges. For the buttons, I managed to find the exact colour at JB Stores, Iklin, Malta. They are glass-like 10mm buttons with shanks. Not the cheapest buttons but they were perfect. Next up was the hat. This one was quite a breeze to make. It’s absolutely adorable. It kind of looks like one of those 20s hats and it can also be worn in a beret-style if one so wished. The mittens on the other hand, were a bit problematic when it came to knitting up the thumb-piece. It was way too long! I just unravelled the thumb part and reduced the amount of rows drastically to end up with what I have in the picture below. Sorry about the poor quality of the photo by the way…it wasn’t my best day for taking photos. All in all, to be honest, I think it came out pretty darn well, even if I say so myself. However, I am still annoyed at the poor quality of the explanations in the pattern. Still, if you like the pattern and you’re still interested in purchasing it, let me know and I will gladly help you out with it seeing as I’ve already gone through it. Anyway, I’m going to love you and leave you here for now. If you’ve ever purchased a pattern and had trouble with it, let me know how you got on in the end. I love to hear from like-minded people. In the meantime, take care and keep on crafting! * This is an affiliate link. I earn a small affiliate percentage from any purchase you make using this link.